While writing numerous animal characters in his children’s books, E. B. White also scribed humorous biographical essays documenting his observations of man’s best friend—collected here. E. B. White has been called a defining voice of American letters. Essayist for the New Yorker, beloved author of Charlotte’s Web and Stuart Little, and co-author of The Elements of Style, White’s work has rested on his exact observations and his superbly compassionate and humorous voice. 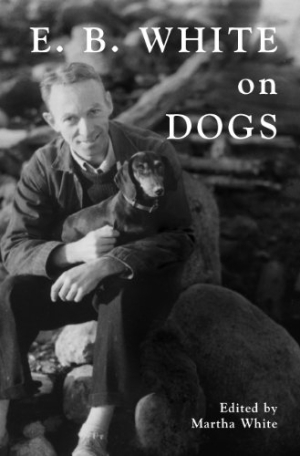 This book collects whatever he wrote about dogs—in columns, essays, and private correspondence—most of it previously published in other collections. Granddaughter Martha White edits and introduces the collection. The pieces, supplemented by an occasional photograph, are arranged chronologically. Thus, the reader moves with White through life in New York, the early days of his marriage to editor Katharine White, their move to a Maine farm, children and grandchildren, World War II, Katharine’s death, and old age. All along, White keeps dogs and a menagerie of other creatures. It hardly matters. While this collection may not be the most complete introduction to White’s work, it’s a good introduction to White. And any dose of this reasonable, witty voice is a welcome shot in the arm. Good reading for dog and White fans alike, this book makes one almost wish to be a dog, if that’s what it takes to be so closely observed and understood.